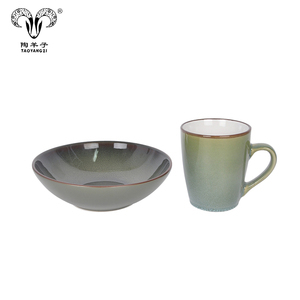 3 YRS Shanxi Jiakun International Trading Co., Ltd.
1 YRS Shanghai Jinying Porcelain Co., Ltd.
High quality novel brass dinnerware set Elegant presentation for dinner, our item will decorate your table as well as your vivid life. 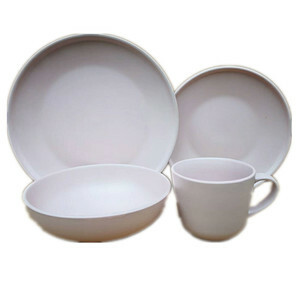 Packaging & Shipping About shipment: We will choose the shipping way as your requirement ,by sea ,by air ,by express etc Shipping photos of brass dinnerware set We Provide OEM Services: And we can make the mugs according to your design . 7. How we send the payment to you9 A: We accept payment by T/T; Western Union, 8. Can you provide more pictures & details of the product so that i introduce to my customer9 A: Yes, please contact our sale person for more information. We have a professional team making material market research to purchase the best raw material at the best price. b). With the high quality, our products sell well in Australia, Southeast Asia and other area. All our items are fashionable and modern designs, enjoy popular sales in overseas markets b). 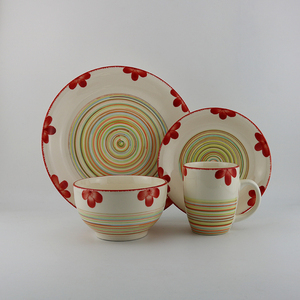 handpainting color stripe stoneware ceramic dinner set ITEM NO DESP. Follow the tenet of "Quality First, Credit Based". Looking forward to hearing your soon inquiry. 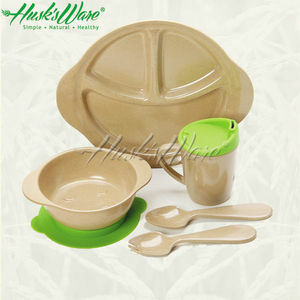 All products are made from natural plant fiber materials, such as corn stalk, rice husk, bamboo fiber. By using our core technology, our products are without any chemical, formaldehyde and melamine. What's the material,are they biodegradable9 A: Mainly plant fiber and corn stalk etc,biodegradable and disintegrated, Q. 7 YRS Hunan Hualian China Industry Co., Ltd.
Key Specifications/Special Features: 7pcs stainless steel seafood tools set Item No. : SK7508 Material: Stainless steel, Description: 2pcs tongs 4pcs fork Packing: each set in color gift box Packing details: Qty/CTN: 48sets Carton size: 46 x 30 x 30cm G.W./N.W. : 13kgs/12kgs MOQ: 5000sets FOB port: Shenzhen Delivery time: 30days Payment terms: T/T or L/C at sight Company brief introduction: We are the manufacturer and exporter of knife,scissors,BBQ tools,tableware and kitchenware with 10 years experiences in China, Our factory located in YangJiang City of GuangDong Province, Our Main market is America,South America, Europe and Middle east,please kindly browse our website to know more informations about our company and products. Easy to clean to prevent bacteria growth. Do not use to chop of pry as this may chip the tip of knife. or the blade to break free from the handle. , Ltd is located in Dongguan City in Guangdong Province. We specialize in producing all kinds of stainless steel cutlery. In addition, our delivery is much quicker and our quality is more stable. We wish our high quality product can get your long term business ship. More Related Product Picture Advantage * Shen zhen New Prosperous Xin Co. , Ltd is a professional Manufacturer of hardware in Shen zhen,China. 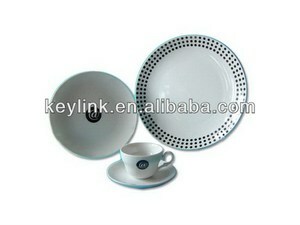 Alibaba.com offers 253 brass dinnerware set products. About 40% of these are dinnerware sets, 25% are flatware sets, and 9% are dishes & plates. 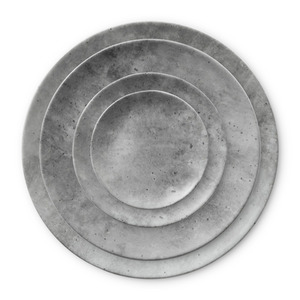 A wide variety of brass dinnerware set options are available to you, such as metal, glass. You can also choose from free samples, paid samples. 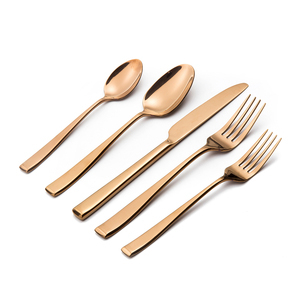 There are 253 brass dinnerware set suppliers, mainly located in Asia. 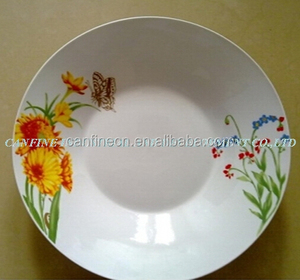 The top supplying country is China (Mainland), which supply 100% of brass dinnerware set respectively. 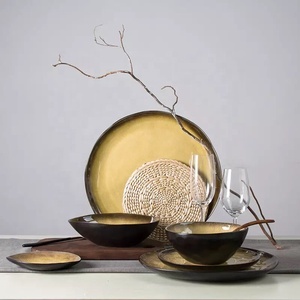 Brass dinnerware set products are most popular in North America, Mid East, and Western Europe. You can ensure product safety by selecting from certified suppliers, including 26 with Other, 26 with ISO9001, and 17 with ISO14001 certification.